For too long the oil and gas industry has polluted the ocean with seismic airgun noise with little consequence. The industry uses seismic airguns in order to find their next lucrative reserve under the seafloor, and because their operations are out of sight and the noise is underwater many have not noticed this deafening (literally1) noise. As terrestrial and vision-dependent animals, we humans have a hard time appreciating the importance of sound in the marine environment. Most of the ocean is a dark place, where vision does not work well, so many animals are dependent on sound to survive. Especially marine mammals like whales and dolphins. But, hearing is believing, so let’s have a listen to a recording of seismic airguns firing in the South Taranaki Bight (STB) of New Zealand, a known blue whale feeding area. This is a short audio clip of a seismic airgun firing every ~8 seconds (a typical pattern). Before you hit play, close your eyes and imagine you are a blue whale living in this environment. Now, put that clip on loop and play it for three months straight. Yes, three months. This consistent, repetitive boom is what whales living in a region of oil and gas exploration hear, as seismic surveys often last 1-4 months. So, how loud is that, really? Your computer or phone speaker is probably not good enough to convey the power of that sound (unless you have a good bass or sub-woofer hooked up). Industrial seismic airgun arrays are among the loudest man-made sources2 and the noise emitted by these arrays can travel thousands of kilometers3. Noise from a single seismic airgun survey can blanket an area of over 300,000 km2, raising local background noise levels 100-fold4. Now, oil and gas representatives frequently defend their seismic airgun activities with two arguments, both of which are false. You can hear both these arguments made recently in this interview by a representative of the oil and gas industry in New Zealand defending a proposal to conduct a 3 month-long seismic survey in the STB while blue whales will be feeding there. First, the oil and gas industry claim that whales and dolphins can just leave the area if they choose. But this is their home, where they live, where they feed and breed. These habitats are not just anywhere. Blue whales come to the STB to feed, to sustain their bodies and reproductive capacity. This habitat is special and is not available anywhere else nearby, so if a whale leaves the STB because of noise disturbance it may starve. Similarly, oil and gas representatives have falsely claimed that because whales stay in the area during seismic airgun activity this indicates they are not being disturbed. If you had the choice of starving or listening to seismic booming you might also choose the latter, but this does not mean you are not disturbed (or annoyed and stressed). Let’s think about this another way: imagine someone operating a nail gun for three months in your kitchen and you have nowhere else to eat. You would stay to feed yourself, but your stress level would elevate, health deteriorate, and potentially have hearing damage. During your next home renovation project you should be happy you have restaurants as alternative eateries. Whales don’t. Second, the oil and gas industry have claimed that the frequency of seismic airguns is out of the hearing range of most whales and dolphins. This statement is just wrong. Let’s look at the spectrogram of the above played seismic airgun audio clip recorded in the STB. A spectrogram is a visual representation of sound (to help us vision-dependent animals interpret sound). Time is on the horizontal axis, frequency (pitch) is on the vertical axis, and the different colors on the image indicate the intensity of sound (loudness) with bright colors illustrating areas of higher noise. Easily seen is that as the seismic airgun blasts every ~8 seconds, there is elevated noise intensity across all frequencies (bright yellow, orange and green bands). This noise intensity is especially high in the 10 – 80 Hz frequency range, which is exactly where many large baleen whales – like the blue whale – hear and communicate. A spectrogram of the above played seismic airgun audio clip recorded in the South Taranaki Bight, New Zealand. Airgun pulses every ~8 seconds are evident by elevated noise intensity across all frequencies (bright yellow, orange and green bands), which are especially intense in the 10 – 80 Hz frequency range. 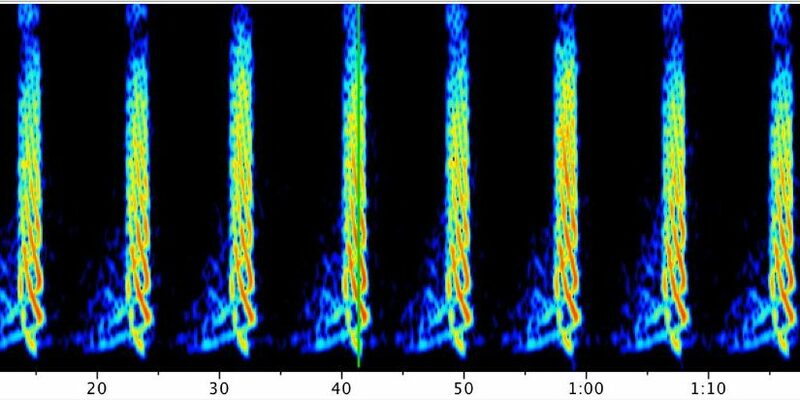 Now, let’s look at a spectrogram of seismic airgun pulses and a blue whale call happening at the same time. The seismic airgun blasts are still evident every ~8 seconds, and the blue whale call is also evident at about the 25 Hz frequency (within the pink box). Because blue whales call at such a low frequency humans cannot hear their call when played at normal speed, so you will only hear the airgun pulses if you hit play. But you can see in the spectrogram that five airgun blasts overlapped with the blue whale call. No doubt this blue whale heard the repetitive seismic airgun blasts, and vocalized in the same frequency range at the same time. Yet, the blue whale’s call was partially drowned out by the intense seismic airgun blasts. Did any other whale hear it? Could this whale hear other whales? Did it get the message across? Maybe, but probably not very well. Some oil and gas representatives point toward their adherence to seismic survey guidelines and use of marine mammal observers to reduce their impacts on marine life. In New Zealand these guidelines only stop airgun blasting when animals are within 1000 m of the vessel (1.5 km if a calf is present), yet seismic airgun blasts are so intense that the noise travels much farther. So, while these guidelines may be a start, they only prevent hearing damage to whales and dolphins by stopping airguns from blasting right on top of animals. So, what does this mean for whales and other marine animals living in habitat where seismic airguns are operating? It means their lives are disturbed and dramatically altered. Multiple scientific studies have shown that whales change behavior5, distribution6, and vocalization patterns7 when seismic airguns are active. Other marine life like squid8, spiny lobster9, scallops10, and plankton11 also suffer when exposed to airgun noise. The evidence has mounted. There is no longer a scientific debate: seismic airguns are harmful to marine animals and ecosystems. What we are just starting to study and understand is the long-term and population level effects of seismic airguns on whales and other marine life. How do short term behavioral changes, movement to different areas, and different calling patterns impact an individual’s ability to survive or a population’s ability to persist? These are the important questions that need to be addressed now. Seismic airgun surveys to find new oil and gas reserves are so pervasive in our global oceans, that airgun blasts are now heard year round in the equatorial Atlantic3, 12. As reserves shrink on land, the industry expands their search in our oceans, causing severe and persistent consequences to whales, dolphins and other marine life. The oil and gas industry must take ownership of the impacts of their seismic airgun activities. It’s imperative that political, management, scientific, and public pressure force a more complete assessment of each proposed seismic airgun survey, with an honest evaluation of the tradeoff between economic benefits and costs to marine life. Restrict seismic airgun operation in and near sensitive environmental areas, such as marine mammal feeding and breeding areas. Prohibit redundant seismic surveys in the same area. If one group has already surveyed an area, that data should be shared with other groups, perhaps after an embargo period. Cap the number and duration of seismic surveys allowed each year by region. Promote the use of renewable energy sources. Develop new and quieter survey methods. Even though we cannot hear the relentless booming, this does not mean it’s not happening and harming animals. Please listen one more time to 1 minute of what whales hear for months during seismic airgun operations. Sonic Sea: Emmy award winning film about ocean noise pollution and its impact on marine mammals. Gordon, J., et al., A review of the effects of seismic surveys on marine mammals. Marine Technology Society Journal, 2003. 37(4): p. 16-34. National Research Council (NRC), Ocean Noise and Marine Mammals. 2003, National Academy Press: Washington. p. 204. Nieukirk, S.L., et al., Sounds from airguns and fin whales recorded in the mid-Atlantic Ocean, 1999–2009. The Journal of the Acoustical Society of America, 2012. 131(2): p. 1102-1112. Weilgart, L., A review of the impacts of seismic airgun surveys on marine life. 2013, Submitted to the CBD Expert Workshop on Underwater Noise and its Impacts on Marine and Coastal Biodiversity 25-27 February 2014: London, UK. .
Miller, P.J., et al., Using at-sea experiments to study the effects of airguns on the foraging behavior of sperm whales in the Gulf of Mexico. Deep Sea Research Part I: Oceanographic Research Papers, 2009. 56(7): p. 1168-1181. Castellote, M., C.W. Clark, and M.O. 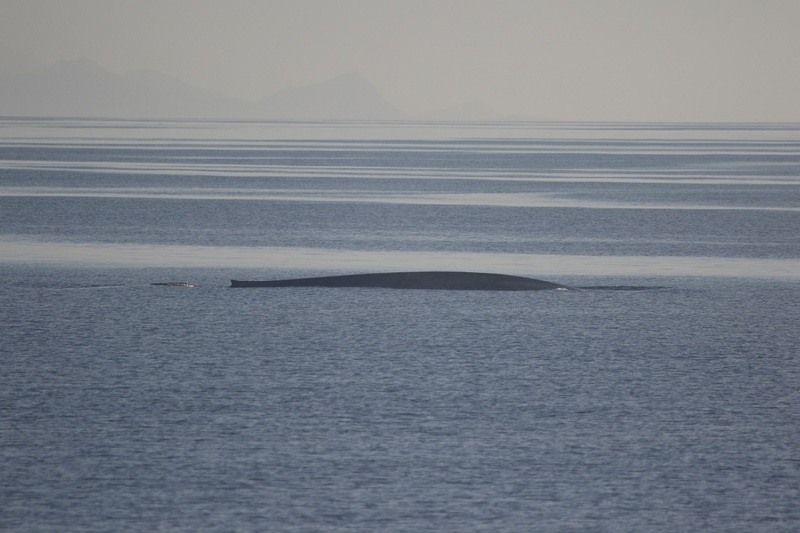 Lammers, Acoustic and behavioural changes by fin whales (Balaenoptera physalus) in response to shipping and airgun noise. Biological Conservation, 2012. 147(1): p. 115-122. Di lorio, L. and C.W. Clark, Exposure to seismic survey alters blue whale acoustic communication. Biology Letters, 2010. 6(1): p. 51-54. Fewtrell, J. and R. McCauley, Impact of air gun noise on the behaviour of marine fish and squid. Marine pollution bulletin, 2012. 64(5): p. 984-993. Fitzgibbon, Q.P., et al., The impact of seismic air gun exposure on the haemolymph physiology and nutritional condition of spiny lobster, Jasus edwardsii. Marine Pollution Bulletin, 2017. Day, R.D., et al., Exposure to seismic air gun signals causes physiological harm and alters behavior in the scallop Pecten fumatus. Proceedings of the National Academy of Sciences, 2017. 114(40): p. E8537-E8546. McCauley, R.D., et al., Widely used marine seismic survey air gun operations negatively impact zooplankton. Nature Ecology & Evolution, 2017. 1(7): p. s41559-017-0195. Haver, S.M., et al., The not-so-silent world: Measuring Arctic, Equatorial, and Antarctic soundscapes in the Atlantic Ocean. Deep Sea Research Part I: Oceanographic Research Papers, 2017. 122: p. 95-104. It’s often difficult to directly see the application of our research to environmental management decisions. This was not the case for me as I stepped off our research vessel Tuesday morning in Wellington and almost directly (after pausing for a flat white) walked into an environmental court hearing regarding a permit application for iron sands mining in the South Taranaki Bight (STB) of New Zealand (Fig. 1). The previous Thursday, while we surveyed the STB for blue whales, I received a summons from the NZ Environmental Protection Authority (EPA) to appear as an expert witness regarding blue whales in NZ and the potential impacts of the proposed mining activity by Trans-Tasman Resources Ltd. (TTR) on the whales. As I sat down in front of the four members of the EPA Decision Making Committee, with lawyers for and against the mining activity sitting behind me, I was not as prepared as I would have liked – no business clothes, no powerpoint presentation, no practiced summary of evidence. But, I did have new information, fresh perspective, and the best available knowledge of blue whales in NZ. I was there to fill knowledge gaps, and I could do that. Figure 1. Distribution map of blue whale sightings (through Nov 2016) in the South Taranaki Bight (STB) of New Zealand, color-coded by month. Also identified are the current locations of oil and gas platforms (black flags) and the proposed area for seabed mining (yellow polygon). The green stars denote the location of our hydrophones within the STB that record blue whale vocalizations. The source of the upwelling plume at Kahurangi Point, on the NW tip of the South Island, is also identified. Why should the noise impacts from the proposed iron sands mining operation on blue whales be considered when seismic survey activity produces noise 1,000 to 100,000 times louder? My answer: Seismic survey noise is very loud, but it’s important to note that seismic and mining noises are two different types of sound sources. Seismic surveys noise is an impulsive noise (a loud bang every ~8 seconds), while the mining operation will produce non-impulsive (continuous) sound. Also, the mining operation will likely be continuous for 32 years. Therefore, these two sound sources are hard to compare. It’s like comparing the impacts of listening to pile driving for a month, and listening to a vacuum cleaner for 32 years. What’s important here is to considering the cumulative effects of both these noise sources occurring at the same time: pile driving on top of vacuum cleaner. How many blue whales have been sighted within 50 km of the proposed mining site? My answer: Survey effort in the STB has been very skewed because most marine mammal sighting records have come from marine mammal observers aboard seismic survey vessels that primarily work in the western regions of the STB, while the proposed mining site is in the eastern region. So at first glance at a distribution map of blue whale sightings (Fig. 1) we may think that most of the blue whales are found in the western region of the STB, but this is incorrect because we have not accounted for survey effort. During our past three surveys in the STB we have surveyed closer to the proposed mining site. In 2014 our closest point of survey approach to the mining site was 26 km, and our closest sighting was 63 km away. In 2016, we found no whales north of 40’ 30” in the STB and the closest sighting was 107 km away from the proposed mining site, but this was a different oceanographic year due to El Niño conditions. During this recent survey in 2017, our closest point of survey approach to the proposed mining site was 22 km, and our closest sighting was 29 km, with a total of 9 sightings of 16 blue whales within 50 km of the proposed mining site. With all reported sighting records of blue whales tabulated, there have been 16 sightings of 33 blue whales within 50 km of the proposed mining site. Considering the minimal survey effort in this region, this is actually a relatively high number of blue whale sighting records near the proposed mining site. Additionally, we have a hydrophone located 18.8 km from the proposed mining site. We have only analyzed the data from January through June 2016 so far, but during this period we have an 89% daily detection rate of blue whale calls. Why are blue whales in the STB and where else are they found in NZ? My answer: A wind-driven upwelling system occurs off Kahurangi Point (Fig. 1) along the NW coast of the South Island. This upwelling brings nutrient rich deep water to the surface where it meets the sunlight causing primary productivity to begin. Currents push these productive plumes of water into the STB and zooplankton, such as krill that is the main prey item of blue whales, aggregate in these productive areas to feed on the phytoplankton. Blue whales spend time in the STB because they depend on the predictability of these large krill aggregations in the STB to feed efficiently. Sightings of blue whales have been reported in other areas around New Zealand, but nowhere with regular frequency or abundance. 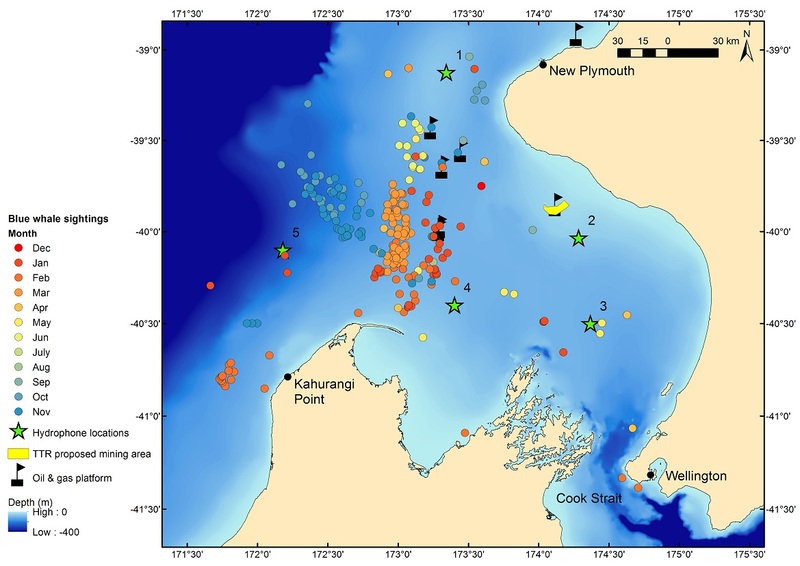 There may be other areas where blue whales feed occasionally or regularly in New Zealand waters, but these areas have not been documented yet. We don’t know very much about these newly documented New Zealand blue whales, yet what we do know is that the STB is an important foraging area for these animals. Questions like these went on and on, and I was probed with many insightful questions. Yet, the question that sticks with me now was asked by the Chair of the Decision Making Committee regarding the last sentence in my submitted evidence where I remarked on the importance of recognizing the innate right of animals to live in their habitat without disturbance. “This sounds like an absolute statement,” claimed the Chair, “like no level of disturbance is tolerable”. I was surprised by the Chair’s focus on this statement over others. I reiterated my opinion that we, as a society, need to recognize the right of all animals to live in undisturbed habitats whenever we consider any new human activity. “That’s why we are all here today”, I explained to the committee, “to recognize and evaluate the potential impacts of TTR’s proposed mining operation on blue whales, and other animals, in the STB”. Undisturbed habitat may not always be achievable, but when we make value-based decisions regarding permitting industrial projects we need to recognize biodiversity’s right to live in uncompromised environments. I do not envy this Decision Making Committee, as over three weeks they are hearing evidence from all sides on a multitude of topics from environmental, to economic, to cultural impacts of the proposed mining operation. They will be left with the very hard task of balancing all this information and deciding to approve or decline the mining permit, which would be a first in NZ and may open the floodgates of seabed mining in the country. My only hope is that our research on blue whales in NZ over the last five years has filled knowledge gaps, allowing the Decision Making Committee to fully appreciate the importance of the STB habitat to NZ blue whales, and appropriately consider the potential impacts of TTR’s proposed mining activities on this unique population. A blue whale surfaces in a calm sea in the South Taranaki Bight of New Zealand (Photo L. Torres).